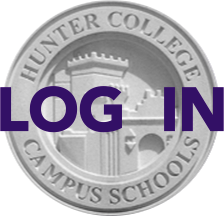 Starting with the 2014-2015 school year, Hunter will embark on a new approach to community and school culture. The school's goal is to bring those issues more explicitly and consistently into the conversations we have and the work we do at Hunter. Work will focus on the ideals of community, diversity, and individuality. Each year, the entire school community will focus on how one of six values plays a part in those ideals. The values are: compassion, creativity, curiosity, integrity, respect, and responsibility. This inaugural year, the "core value" will be Respect.